The title of this post, is the same as that on an article in Edition 849 of Rail Magazine. The article is based on this document on the Fen Line Users Aoociation web site, which is entitled Joint Response To Draft East Coast Main Line Route Study. The Fen Line runs between Ely and King’s Lynn stations. It is mainly single -track with a double-track section at Downham Market station. The line has an operating speed of 90 mph. All stations have two platforms. Looking at the line from my virtual helicopter, I suspect that redoubling would be possible. Passenger numbers are increasing at stations on the line. There are several level crossings. It also would appear that because of the complicated nature of timetabling trains on the East Coast Main Line to the South of Hitvhin, that there are often delays on the Fen Line, as there is only one passing place at Downham Market. I therefore agree with the opinions expressed on the Fen Line Users Association, that restoring double-track could help reduce delays on the Fen Line. The Cambridge Line connects Cambridge to the East Coast Main Line at Hitchin. It has a 90 mph operating speed. Kking’s Lynn to Kings Cross services use the line. Currently four trains per hour (tph) run between Cambridge and Kings Cross. This will be increased by two tph, when Thameslink is fully operational. King’s Lynn to Kings Cross services use this line. Trains seem to take around an hour and forty minutes to go from Kings Cross to King’s Lynn, where they take under ten minutes to turnround and then they take around an hour and forty minutes to return to Kings Cross. I suspect, it isn’t the easiest service for an operator to mrun, as a train could be sitting in Kings Cross for thirty minutes. How Could The Service Between King’s Lynn and Kings Cross Be Improved? From the Rail Magazine article, the views of the Fen Line Users Association and the details of the route, the following could help. ERTMS and the closely related; ETCS sre digital systems that enable trains to run faster and closer together, which could increase the capacity of the line and reduce journey times. The Wikipedia entry for the East Coast Main Line says this about recent and future development of the signalling. A new Rail Operating Centre (ROC), with training facilities, opened in early 2014 at the “Engineer’s Triangle” in York. The ROC will enable signalling and day-to-day operations of the route to be undertaken in a single location. Signalling control/traffic management using ERTMS is scheduled to be introduced from 2020 on the ECML between London King’s Cross and Doncaster – managed from the York ROC. I would think it likely that if the whole route from King’s Lynn and Kings Cross were digitally signalled, there would be advantages. It would help the merging of trains at Hitchin. It would help in managing trains on the single-track sections of the Fen Line. The Rail Magazine article mentions flighting trains on the single-track sections, where two or more trains in the same direction, went though in succession. It would also allow closer spacing and higher frequencies on the East Coast Main Line. All trains using the route, including freight trains, would need to be fully equpped for digital signalling. The biggest improvement would come by redoubling the line between Littleport and King’s Lynn. Trains could pass anywhere on the Fen Line. It might also be possible to avoid complicated operating procedures. Extra services would be possible. Delays should be reduced, as there would be less knock-on effects from problems on the East Coast Main Line. But on the flat lands of the fens, it might also be possible to increase the operating speed. Ely is a mess, where trains always seem to be waiting for something. Hopefully, improvements are on the way, as I wrote in Are The Trains In Ely Finally To Be Sorted? According to an e-mail and comments on this post, Ely North Junction needs improvement. Ely station is to the South West. starting at the top-left and going clockwise, lines go to Peterborough, Ely and Norwich. The last set of lines are sidings. There would appear to be two solutions. Extra lines and flat junctions can be added. 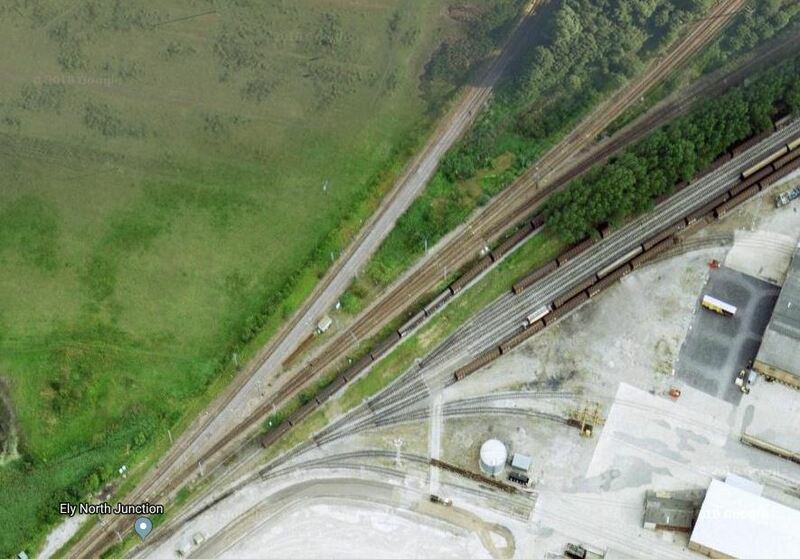 Flat junctions mean that trains have to cross each other. From what I’ve read digital signalling is very good at handling junctions, by making sure trains present themselves correctly, so this may be a better solution. Either solution could be make to work very well! There don’t appear to be any projects on the Cambridge Line, but I suspect that Network Rail are looking for small things, that will save minutes here and there. Who’d have thought forty or fifty years ago, that someone would seriously suggest running trains capable of 125 mph to King’s Lynn? The Class 387 trains are 110 mph trains and I have recorded one at that speed on the East Coast Main Line. Would a 125 mph train, be able to use that speed South of Hitchin? It could cruise on the fast lines with all the fast trains to and from the North. It would cut a couple of minutes from the journey time. Once digital signalling is operational, the trains could be closer together, which would increase line capacity. There are several fast electric multiple units, that have been built in recent years or are on order. Bombardier Class 387 – 110 mph – In service. Bombardier Aventra – 110 mph -In development for West Midlands Trains. CAF Class 397 – 125 mph – In development for TransPennine Express. Hitachi Class 801 – 125 mph On test for service entry this year. Siemens Class 350 – 110 mph – In service. Bombardier are also showing ideas for a 125 mph bi-mode Aventra to various train operating companies, which I wrote about in Bombardier Bi-Mode Aventra To Feature Battery Power. To build a 125 mph bi-mode train, you probably start with a 125 mph electric train. So have Bombardier designed a 125 mph version of the Aventra? It would appear, that Bombardier, Hitachi and possibly CAF and Stadler will be offering 125 mph electric multiple units, with a bi-mode version if needed, for lines without electrification. Train travel could be getting faster? The ultimate benefit would come if trains could do a round trip in under three hours. This would probably need a journey time of perhaps an hour and twenty-four minutes between Kings Cross and King’s Lynn. It is certainly not possible now, but it might be with the following. Digital signalling on the East Coast Main Line and on the Cambridge and Fen Lines. 125 mph running, where possible on the East Coast Main Line. Full double-tracking of the Fen Line. If possible, 100 mph running on the Cambridge and Fen Lines. A three-hour round trip would allow the current service of one tph to be run with just three trains. If both of the twice-hourly fast services between Kings Cross and Cambridge were extended to King’s Lynn, instead of the current one, this would mean that the following service could be possible with just six trains. Stops at Cambridge, Cambridge North, Waterbeach, Ely, Littleport, Doenham Market and Watlington. Ten x 23 metre cars or Twelve x 20 metre cars. There is improvement to come between Kings Cross, Cambridge and King’s Lynn, if the financial case stacks up. The Fen Line runs between Cambridge and King’s Lynn, via Ely. The single line sections are between King’s Lynn and Watlington (about 6 miles) and Watlington and Littleport (about 10 miles) plus a short – but critical – length at Ely North Junction, about 1 mile north of Ely station. The approx. 16 miles between Ely North Junction are double track. Taken together, the single track sections total about 16 miles. The double track section between Watlington and Downham Market functions as a dynamic loop, where trains can pass at speed. 90 mph is the top speed. 90 mph sections north of Cambridge are almost entirely between Littleport and King’s Lynn. North of Ely, trains can pass between Ely station and Ely North Junction (but not at the Junction), between Ely North Junction and Littleport and between Downham Market and Watlington. Currently, most passenger trains are scheduled to pass at Downham Market, where ECML delays can result in southbound trains having to wait for late-running northbound trains, thus creating more delays further south. Poor timekeeping of long distance trains on the ECML is said by drivers to be the main reason for late running. Additional point: there are twice-daily freight trains between King’s Lynn and Ely North Junction. These carry silica sand from the Middleton Towers sand quarries. None of the above challenges your conclusions! When Thameslink is fully operational, there will be six trains per hour over this section. 2 Cambridge-Brighton, 2 Cambridge North/Cambridge-Maidstone East/Ashford and 2 King’s Lynn/Ely. The latter trains mainly run fast south of Cambridge and are shown in the NR Timetable as ‘The Cambridge Express’. There is interworking of trains with the Great Northern King’s Cross-Peterborough service and the suggested 30 minutes layover at King’s Cross is not general practice. The biggest improvement would come by redoubling the two single line sections between Littleport and King’s Lynn. The reinstatement of the double junction at Ely North Junction would also be important! Virtually all of the twice-hourly fast services between King’s Cross and King’s Lynn are extended to Ely or King’s Lynn. In the peaks, the King’s Cross service is twice-hourly from King’s Lynn. Taking into account peak portion working of ‘The Cambridge Express’ – plus the handful of King’s Lynn-Liverpool Street trains – this means that there are times when there are three trains per hour from or to King’s Lynn (e.g. 0714 King’s Lynn-King’s Cross (portion), 0725 King’s Lynn-King’s Cross (portion) – portions join at Cambridge – and 0754 King’s Lynn-King’s Cross or arrivals at King’s Lynn at 1908 (from Liverpool Street), 1927 and 1954 (both from King’s Cross). These periods operate on a ‘tidal flow’ basis, the larger number of trains going with the direction of the commuter flows. These are those periods when ‘flighting’ over the single line sections could prove very useful. Currently, all trains from/to King’s Lynn operate as 4-car units, except for one morning departure to King’s Cross and one evening train back, which operate with 8 cars. Network Rail is working on a project to permit more eight car trains to run to/from King’s Lynn. Twelve x 40 metre should presumably be twelve x 20 metre! As I said, a fascinating and thought-provoking article! Your information makes it obvious that there are more reasons for restoring a complete double track from Cambridge to King’s Lynn. As to train length, I think that if services could be run without joining and splitting at Cambridge that would be an advantage. That must save a couple of minutes.